1 Place chicken thigh in a large saucepan with Recipe Base, apple juice and barbecue sauce. 2 Bring to the boil, cover and simmer for 40 minutes until chicken is cooked. Remove chicken and pull apart meat. Cover and set aside to keep warm. 3 Simmer cooking sauce until thickened and reduced by half, return chicken to pan and stir through sauce. 4 To make the salsa, mix together avocado, corn, onion, coriander and lime juice. 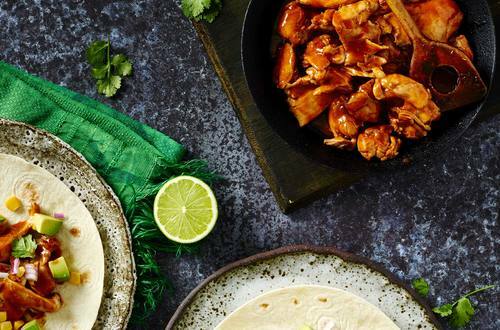 Serve chicken on warm tortillas with salsa.